Last edited by ajayhawkfan on 14 Aug 2017 19:54, edited 1 time in total. This event is always a blast! Ajayhawkfan's generosity in hosting and funding this event is wonderful. Hopefully I can make it again ! It was a good time! gagnaou wrote: Hopefully I can make it again ! It was a good time! You have plenty of notice. Got it! Won't miss it again. Troy, will you be able to get your brother to join us? ajayhawkfan wrote: Troy, will you be able to get your brother to join us? I have not been able to make my brother do anything since I was 5 years old and he was 3.5. That was when I stopped being bigger and stronger than him! I was worried the event included stops at the many fine gentlemen's clubs in the greater Blue Mound area. Ask your brother nicely to join us. I didn't know there were any fine Gentleman's Clubs in the Blue Mound area. Tell me what you know. Friday, Sept. 22 2017 at NOON is the deadline to sign up if you plan on attending the BBQ. RustyJug, the BBQ Pit Master, needs a head count at that time. You can find the link to sign up above. ajayhawkfan wrote: Friday, Sept. 22 2017 at NOON is the deadline to sign up if you plan on attending the BBQ. RustyJug, the BBQ Pit Master, needs a head count at that time. Daryl & I are riding down together in the morning starting with breakfast at a First Watch about 8:30. I have a 95 mile track that should be interesting enough to enjoy a lazy dualsport down to the McLiney Ranch. Anyone who is signed up and would like to join us, just post here or contact me @ troy at rideforum.net. Thank you for hosting a great eve of trail riding ,visiting with friends and BBQ. Your trail additions are really good, trail building and maintance is a ongoing project isn't it. Todd is really good with the BBQ. Thanks again for a great evening I enjoyed it. Eddie! THANKS for hosting such a great event! I had a great time hanging out with folks around the fire, meeting some new friends, riding your trails, and that BBQ is world-class! Like others said, thank you for holding and hosting such an event! 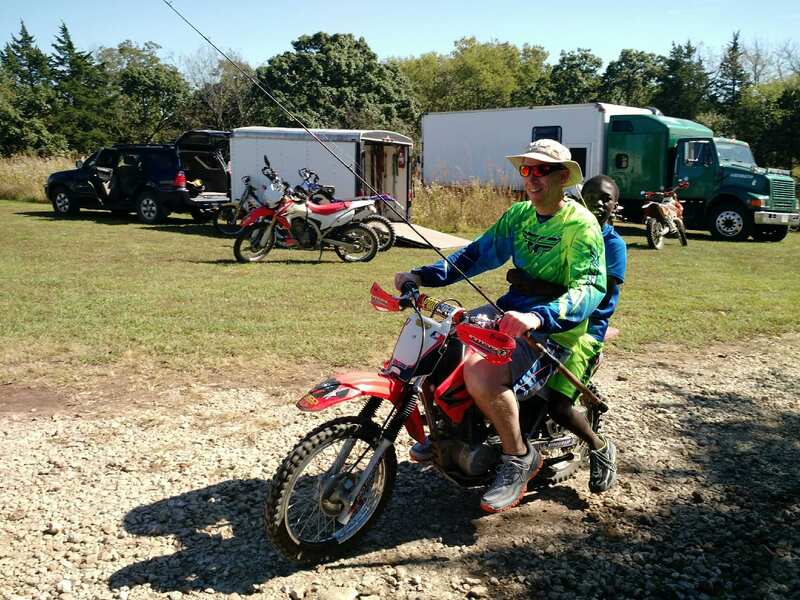 that is the only big bike event I go to every year and every time it is a wonderful time to enjoy the great trails on Eddie's property and to meet some great people! Thanks Troy for the GPS track of the Osage county ride , we had a good time riding it with Bill and John! Friday was a blast as well, Bill and Hi chasing each others on the trails in the property, sure was a lot of fun! I have a cot for sale slept on by a Dakar competitor. I'm glad you all made it. Ann and I had a blast.